Bandera Mountain’s sharply steepled ridge, upswept slopes, and bird’s-eye views accentuate its elevation (5,241 feet/1,585 meters), which is also proven by the effort undertaken in reaching its rugged summit. Bandera Mountain Trail, August 31, 2009. 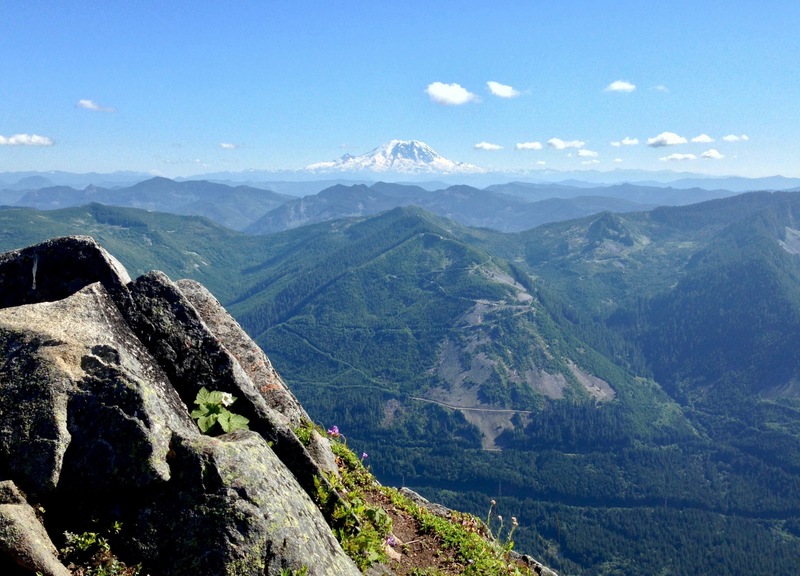 Bandera Mountain’s strenuous ascent rewards fortitude with panoramic views of the South Fork Snoqualmie River Valley, peaks surrounding on all compass points, and, during the brief early summer wildflower season, a kaleidoscopic tapestry of blooms. The trail’s incline increases dramatically as soon as it branches northward from the Ira Spring Trail and, with more boulders than soil and nary a switchback, is not for the weak of knee or ankle. Trekking poles may be helpful. 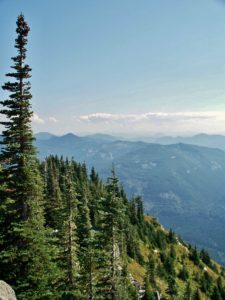 A fire in 1958 left much of the mountaintop nearly bald, from which it has yet to recover, but which affords increasingly grand views as the trail climbs. 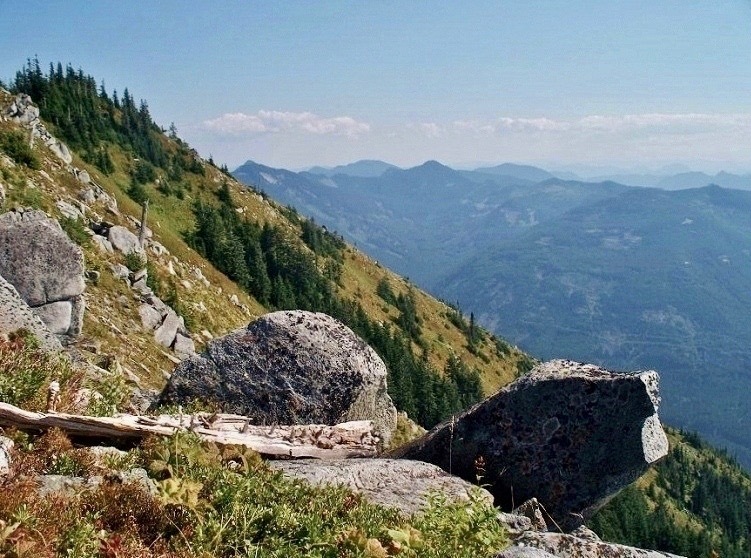 This profile begins where the side trail to Bandera Mountain’s summit turns sharply upward from the Ira Spring Trail, which continues across its lower flank to Mason Lake, Mount Defiance, and other destinations by connecting trails. The Ira Spring Trail is heavily used; however, except during peak wildflower season, few hikers venture up Bandera Mountain’s ramparts, where a bit of ridgetop solitude may be found amongst its jumbled stones. Although the distant whir of Interstate 90 occasionally wafts from the valley floor below, it is hushed by the mountainside’s windswept vastness. From the Ira Spring Trail, the side trail to Bandera Mountain’s summit surges skyward through a vast, boulder-cobbled meadow. Bandera Mountain Trail, July 09, 2014. 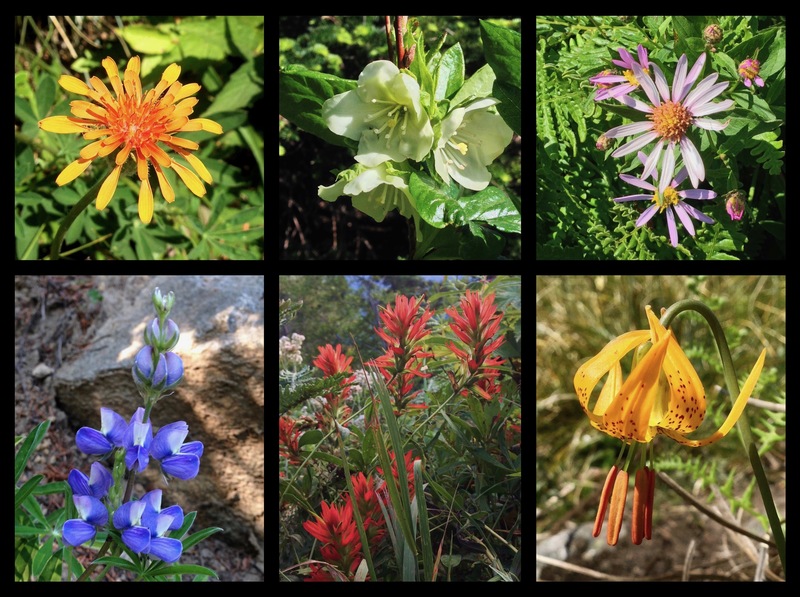 Bandera Mountain’s early summer wildflower display dazzles with a palette of blooms including, clockwise from top left, orange agoseris (Agoseris aurantiaca), white rhododendron (Rhododendron albiflorum), Cascade aster (Eucephalus ledophyllus), Columbia lily (Lilium columbianum), scarlet paintbrush (Castilleja miniata), and lupine (Lupinus sp.). Bandera Mountain Trail, August 18, 2013 and July 09, 2014. 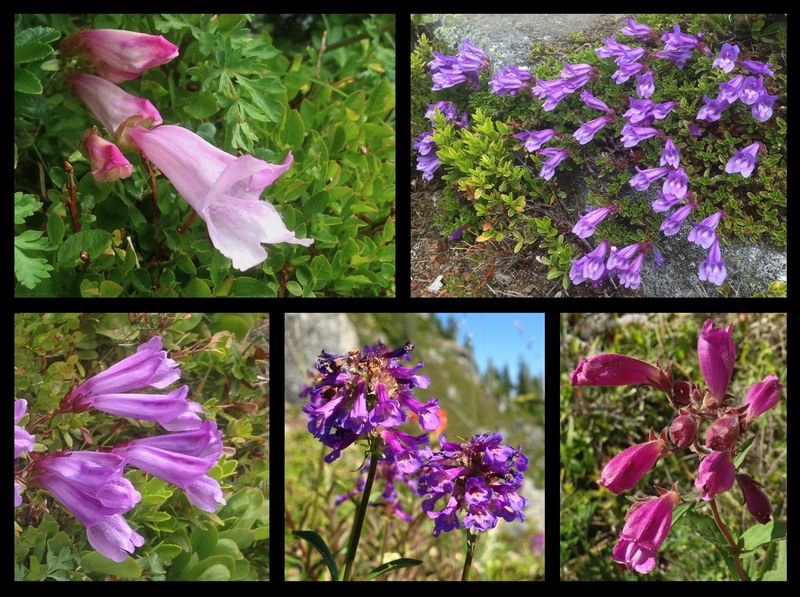 Various species of penstemon flourish among the mountainside stones. Known for their appearance as gaping, disembodied lips and throats, some penstemon are also imaginatively called “beardtongues” because of the fuzz inside their flowers’ yawning gorges. Across the top and in the lower left, maw-like blooms of Davidson’s beardtongues (Penstemon davidsonii) jut from their ridgetop, rockside holds. In the lower center, littleflower, or, pincushion penstemons (Penstemon procerus) loft tiny, pom-pom bloom clusters. As its name implies, the woodland beardtongue (Nothochelone nemorosa), lower right, inhabits open forests as well as mountain meadows and can be found throughout the trailside. Bandera Mountain Trail, July 05 and 09, 2014. 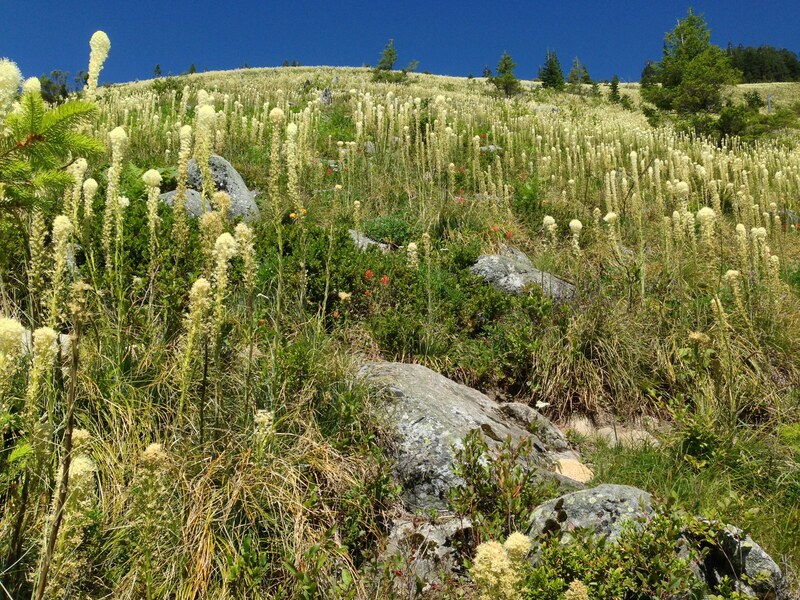 The star of Bandera Mountain’s early summer wildflower display is the beargrass (Xerophyllum tenax), which mantles the slopes in waist-high feather duster-like plumes. Bandera Mountain Trail, July 09, 2014. Set against Mount Defiance‘s westward recline, a vivid bouquet of scarlet paintbrush (Castilleja miniata), beargrass (Xerophyllum tenax), and woodland beardtongue (Nothochelone nemorosa) adorns the trailside. Bandera Mountain Trail, July 09, 2014. Reminiscent of the wildfire that created the mountaintop meadow, a well-placed cloud appears as a wisp of smoke curling from a remnant of the great fire still standing amid a swathe of beargrass (Xerophyllum tenax). Bandera Mountain Trail, July 09, 2014. 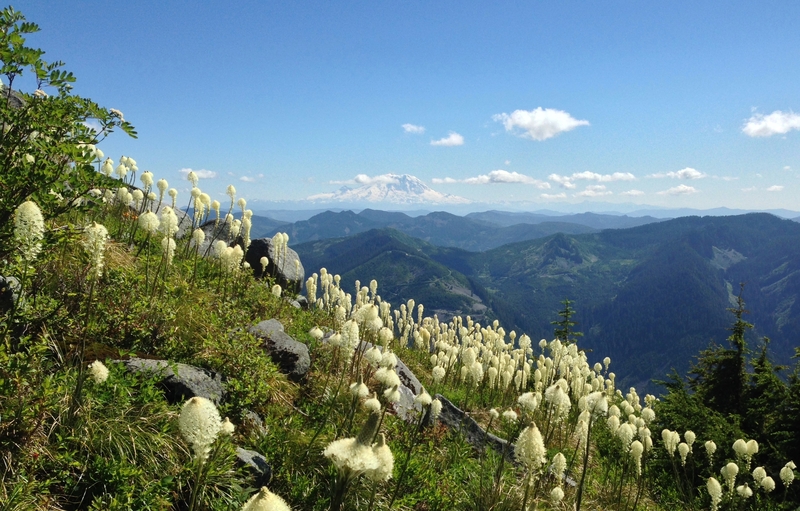 Bandera Mountain’s summer blanket of beargrass (Xerophyllum tenax) blooms mimics the snowy slopes of the distant Mt. Rainier. Bandera Mountain Trail, July 09, 2014. Later in the summer, the beargrass is replaced by cheery drifts of fireweed (Chamerion angustifolium), here fringing the view of neighboring Putrid Pete’s Peak and Mount Defiance. Bandera Mountain Trail, August 18, 2013. Beyond the meadow, the trail picks its way along Bandera Mountain’s boulder-strewn ridgeline, where the view plunges seemingly headlong to the valley floor below. Bandera Mountain Trail, August 18, 2013. In the unfolding view from near Bandera Mountain’s summit, the Cascade Mountains continue northward beyond sight. Bandera Mountain Trail, August 18, 2013. To the west, Bandera Mountain provides a bird’s-eye view of Mason Lake and Mount Defiance. Down the ridge to the left of Mount Defiance rise Putrid Pete’s Peak and Webb Mountain, also known as West Defiance. Bandera Mountain Trail, August 18, 2013. Scattered boulders near the summit of Bandera Mountain anchor the eastern view. Bandera Mountain Trail, August 31, 2009. Interstate 90 snakes westward alongside Bandera Mountain, Mount Defiance, Putrid Pete’s Peak, and Webb Mountain (also known as West Defiance). Bandera Mountain Trail, August 18, 2013. In the panorama sweeping from Bandera Mountain’s summit, Mt. Rainier crowns the southern horizon. Bandera Mountain Trail, July 09, 2014.